2.0 inch diameter pole holder for Coaches with out ladders. The Suction Mount System holds a flagpole firmly to the smooth surface of the Coach. 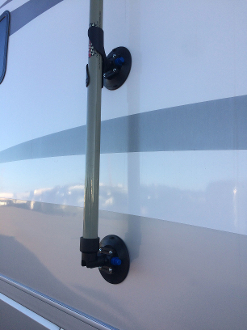 Each massive 6” suction cup has a built in vacuum pump and the standard FlagPole Buddy mounts. They’re easy to install, as the push button pump has a visual red line to let you know when vacuum is secure and release tabs for easy removal. The rubber cup comes with a plastic protective cover for storage. Not recommended for older RVs, poorly maintained surfaces, or sticker decals. “Red Line” may creep out over night due to thermal changes, vacuum is still good but it is recommended to check periodically.